Collecting traffic and usage statistics for a website or portal can be a very time consuming and tedious task. And in most cases you end up compiling monthly or quarterly report for managers and donors that will be shared as email attachments - and at best skimmed, since there is so much information. But there are smarter ways you can do this process and bring life into your data, as as I explained in my previous blog. Our case study is the R4D portal, a free access on-line portal containing the latest information about research funded by DFID, including details of current and past research in over 40,000 project and document records. Until 2013 we were part of the team supporting and managing the site. As part of our work packages, we developed an online, interactive visualization of web traffic and usage of the R4D portal and its social media channels. The R4D dashboard, built using Tableau Public, is still updated and in use. However, since the termination of our support contract, it hasn't been iterated and improved since 2014. This posts presents the process we followed to develop the dashboard, the tools used and the lessons learned in what was very much a learning by doing journey. 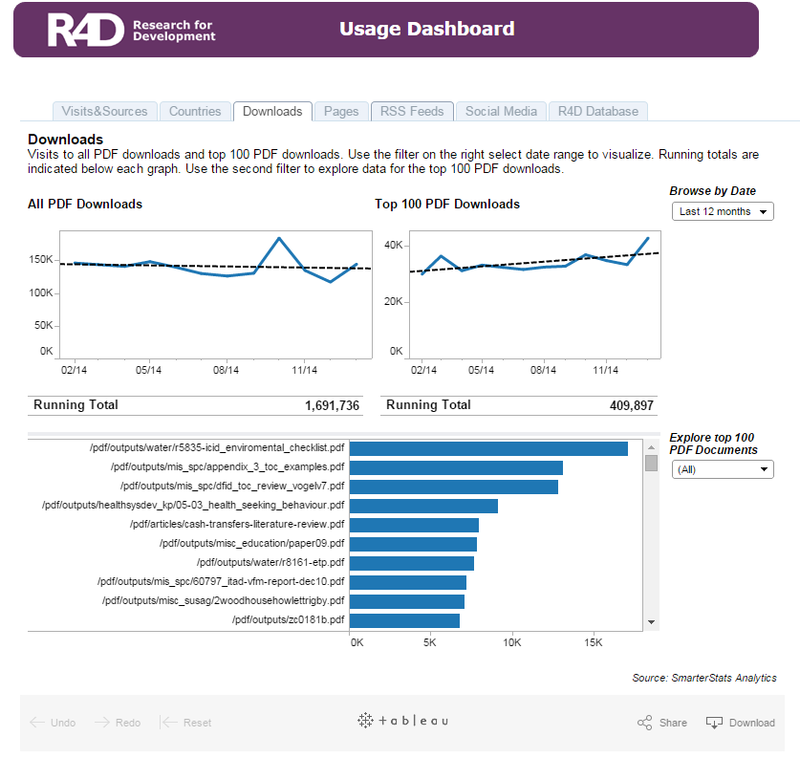 Why develop the R4D dashboard? The collection of usage and traffic data for R4D used to be pretty much standard: a series of excel files updated monthly to generate charts and graphs. They were then put together in a PDF report and shared with project leads at DFID. The idea to develop instead an online, public dashboard of R4D web traffic and usage was inspired by the excellent work from Nick Scott and ODI, which he shared with us during a Peer Exchange session we organized back in 2012. Donor organisations such as DFID collect a lot of statistics and indicators but these are often kept within projects and programmes and not made available for all staff, as was the case for R4D. So the reason behind the R4D dashboard was primarily to open up our stats and make them more accessible to anybody interested in it, not just the people that had sign off on the project. Also, by encouraging a more open approach to web stats, the idea was also to have more terms of comparison: it is difficult to evaluate how well your website is doing if you can only compare against yourself. So being able to see how much traffic similar websites are generating will help you assess your own effort and performance. Website stats: Visits and visitors; referring sites; visitors by country; PDF downloads and top pages. We decided that it was feasible to collect this data monthly as xls or cvs files exported to from the site(s) and save them into a shared Dropbox folder. This was the most effective way as data collection was decentralized with different people working on different platforms. With our limited budget, it was not possible to automate the data collection process, so this was entirely manual. Software platform selection took quite some time in the initial phase of the process. We selected Tableau Public as our dashboard platform, and then had to invest more time in learning its features and functionality. But it was totally worth it! It's intuitive. You don't need to be an expert to use the tool. The interface is very simple (drag and drop) and you can easily find your way around. It's rich and deep. There are so many charts you can choose from and you can play around with different visualization until you are happy with the result. It also goes much deeper than Excel with analysis and interactions. Google Analytics is the industry market standard - but it tends to under-count your traffic. We ran two different website analytics packages on the main R4D portal - Google Analytics (GA) and SmarterStats - and noticed a huge difference in the results, with GA massively under-counting visits and visitors. So it's always worth installing another tracker to be on the safe side. Once your dashboard is set up, the process of updating it with new data is rather quick, just a few clicks and you are done. However data collection from the various sources in our case was mostly manual and it can be time consuming (and not much fun either!). If I were still working on the project, I’d look into ways to automate as much as possible data collection - while also looking at what additional (useful) data I could collect in an automated way. When you're done building your dashboard, you're actually not done. We had a couple of iterations before arriving at the product that is now online. And I'm sure this would be different now had the project continued. This is because you have to evaluate whether the visualizations in the dashboard are actually useful and provide you actionable insights that can inform your strategy. Or simply because the software keeps evolving and can give you new possibilities that were not there before. In the next post on this series I'll present a different approach to develop an M&E dashboard, this time using a combination of Google Forms, Sheets and Charts, together with Google Apps Scripts and Google Docs Add Ons. In the meantime, if you have experience with Tableau or use other tools to create interactive dashboards, why not share it in the comments here?